Our goal at SCL is to develop long-term partnerships and relationships with our customers, understanding on an intricate level your specific needs for fluid maintenance. With our in-house SCL branded oil analysis program we wanted to make it easier for our customers to process their oil, creating a holistic system for managing oil health. As a result, we have contracted with an international lab to offer a series of proprietary tests that will optimize the health and performance of your equipment. Identifying current and potential issues by monitoring trending particle contamination within your engine’s crank case, hydraulic system and cooling system, we can offer suggestions for alternative products and practices. Your oil may not actually be a problem, but based on the presence of specific metals and elements identified through oil analysis testing, we can assess where metal-on-metal contact within your engine may be compromising the integrity of certain engine components such as bearings. Oil analysis allows you to identify wear patterns, which if left unaddressed can lead to costly downtime, repairs and even system failure. Depending on which oil analysis package that you choose – Black, Yellow or Red – you will be testing for such things as viscosity, trace elements, additives, the presence and percentage of water, metals like tin and copper, glycol, sulfur, chlorine, fuel dilution, soot, oxidation, nitration and acids. An SCL consultant will support you in choosing the appropriate test to meet your specific needs, and will assist with the interpretation of test results so that you can make adjustments accordingly. Packages are fully customizable to meet your specific needs, and besides the primary packages listed above, we also offer additional features that an SCL consultant can provide more information on. Over the years our customers have reflected back to us that the easier and more streamlined we can make their operating procedures, the happier they are. With our new oil analysis program, we send you pre-addressed envelopes or containers that are ready to drop in the mail with the appropriate pre-paid postage. No need to visit the post office or FedEx and deal with the hassle of mailing fluids. Samples are mailed directly to the lab and are generally tested within 24 hours, which reduces sample submission time and allows for rapid turnaround and tracking on your results via phone, email or fax. It’s simple and quick. Draw your samples, place them in the appropriate envelope or container, drop them in the mail and then track and receive your results. The SCL Oil Analysis Program also makes it easy to organize the testing process for equipment in different locations. 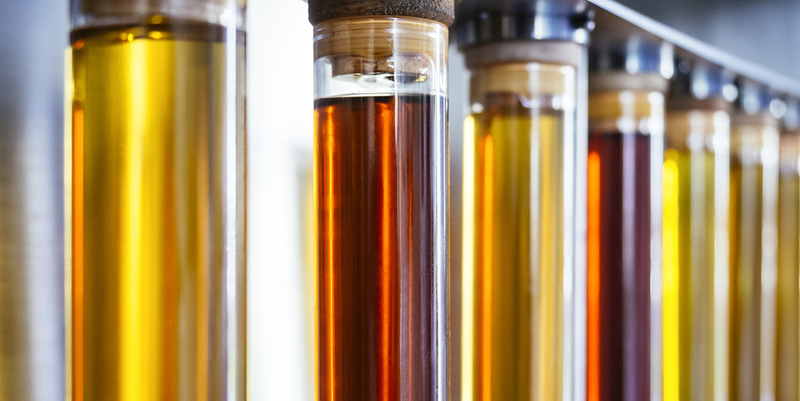 At SCL we greatly value the benefits of consistent oil analysis as a “best practice,” so by creating an in-house branded oil analysis option we can serve our customers to a greater degree, streamlining and maximizing your preventative maintenance schedules. Having these services in-house allows us to closely monitor fluid maintenance and the three-tiered, color-coded system is easy to choose from and implement. Each tier of testing has it’s own customizable pricing and features, and as a future initiative we hope to also develop a single sign-on platform, eliminating the need for multiple sign-ins and passwords for all of your SCL needs – oil analysis, CFN and inventory management. Moving forward we will continue to expand upon the SCL brand initiative to better serve our customers as subject matter experts, providing superior knowledge, proof of performance and proper product application. Where we have developed as an organization is that we now have the sophistication to roll out a program like this. The SCL branded oil analysis program is just the newest way that we are delivering on our core brand elements, providing a service that compliments our existing product and service offerings.